The University of Maryland ALS Clinic has provided families the help they need in managing patients' complex and changing medical needs since 2006. One of only two university-based programs in Maryland, we offer a comprehensive and multidisciplinary approach to care. Our team of specialists includes a neurologist, pulmonologist and nutritionist as well as physical, occupational, speech and respiratory therapists. Offered monthly, this all-day clinic offers evidence-based care that has been thoroughly researched and proven effective at producing positive outcomes for patients. 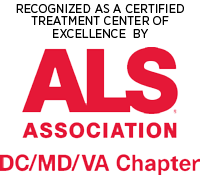 The ALS Association (ALSA), a national nonprofit organization fighting ALS, has named our program a Certified Treatment Center of Excellence — the only program with this designation in the state of Maryland. This is the highest level of certification for ALS clinics given by ALSA. This certification is based on professionals' skill sets, number of people living with ALS served, active involvement in ALS-related research, relationships with local ALS chapters, and access to care. Amyotrophic Lateral Sclerosis (ALS), also known as Lou Gehrig's disease, is a neurodegenerative disease (a condition that primarily affects the neurons in the human brain). Neurons are the building blocks of the nervous system which includes the brain and spinal cord. Neurons normally don't reproduce or replace themselves, so when they become damaged or die they cannot be replaced by the body. A diagnosis of ALS can be challenging for patients and their families. Approximately 3,000 to 5,000 new cases of ALS are diagnosed in the United States each year. For more information about our services or to make an appointment, please call 410-328-3100. Patients must be seen by a neurologist in the Neuromuscular division prior to being seen at UMMC Midtown Campus.